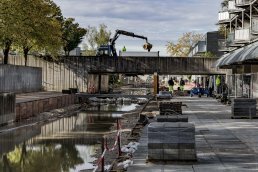 With the renovation of its existing canal and drainage system, Albertslund Municipality has safeguarded the city center from rainstorms. Previously, Albertslund city center was highly vulnerable to cloudbursts. The municipality has tackled this issue with a now completed three-year project. The secret lies in an already established one-and-a-half kilometer long open canal, which was first created for aesthetic purposes. Today, it also diverts rainwater from the northern part of Albertslund, draining away water which would otherwise flood the city center. With increased capacity, better control over water flow and a steeper gradient, the canal can now drain away 90% of the water from northern Albertslund, much more than the previous amount which only accounted for 5%. In addition to renovating the canal, a wetland has been established to slow and store rainwater from the North. The wetland prevents flooding of surrounding creeks and lakes including St. Vejleå. The green area of Kongsholmparken, where the new wetland is located, can hold 55,000 m3 of water. To improve water flow, the canal has been dug deeper in the west end, while gently rising towards the east. The canal renovation project creates a climate-proof urban space with water as an integral element, which has increased accessibility to and biodiversity in the park, Kongsholmparken. The wetland in Kongsholmparken helps to filter rainwater, thereby improving the quality of water in the surrounding lakes and streams and, eventually, in Køge Bay. In connection with the wetland, several new natural habitats have been created including two water basins, restored streams and four amphibian habitats, together boosting biodiversity. Albertslund Municipality is located on the island of Zealand in eastern Denmark.